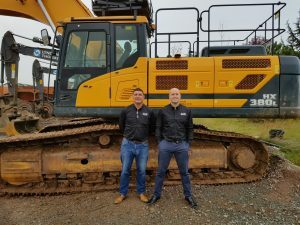 Hyundai are pleased to announce that TBS Plant Ltd, based in Ryhall in Lincolnshire, has been appointed as the new Hyundai Construction Equipment dealer covering four UK counties, which include South Yorkshire, Lincolnshire, Nottinghamshire and Derbyshire. TBS Plant is a newly formed company which comes with a vast range of experience and product knowledge spanning over 50-years, which the TBS Plant management team, led by Steve Corner and Brian Conn, have acquired collectively. Both Steve and Brian have worked extensively with the Hyundai brand over the years through other dealerships. L to R Steve Corner and Brian Conn establish TBS Plant Ltd and take on the Hyundai brand. TBS Plant Ltd will offer the full Line of Hyundai construction equipment from 1st November 2018. Visit www.tbsplant.co.uk for more details.